Managing the Registration Process is quick and simple using the Manage area of the Online Registration process. In this next session we will learn how to use this management system including filters, payment recording, refunding, charging, reports and how to approve and assign members to your Billing and Roster Groups. As registrations begin to roll in, it is time to begin capturing payments and assigning athletes to their specified Roster Groups. The Management area of the Online Registration process is the core of Online Registration. 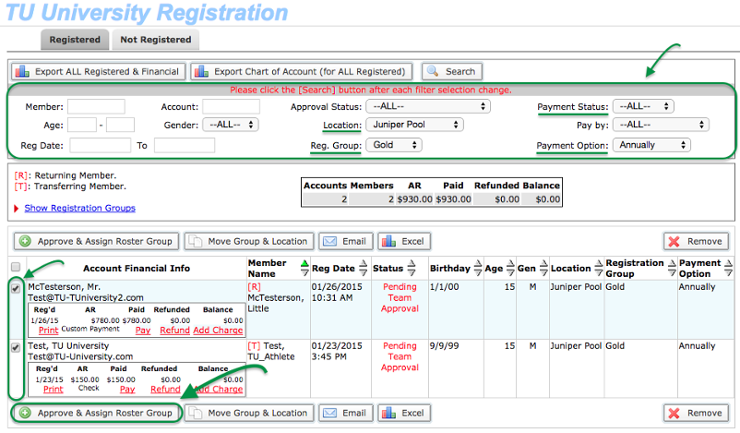 It allows an admin to capture payments and assign members/athletes to Roster Groups. Here is a brief run through of what each area does in Online Registration Manage. Click Team Admin > Registration Admin. Click Manage next to your desired registration. You will be taken to the Manage Registration page. This page has two areas: the Registered tab and the Not Registered tab. Export All Registered & Financial – Use this Excel report to view all information including account information, CoA details, payments, the IP address for the signed waivers and much more. Export Chart of Accounts [for all registered] – Use this report for a summary of all monies collected in your registration. Excel - Make your filter selection, click Search and use the Excel button to generate a report based on this filter set. The report will include all information and financials. At least one account must be selected in order for this report to export data. You can use the filters and select the accounts for which you would like to export Excel data. Filters are very important in the Manage area, they allow you to filter multiple fields to help you find athletes, print reports, assign athletes/members to the proper Roster Groups and see who has selected certain payment options. Filters – Use the filters to find or refine the search to specific accounts/members, then click the Search button to apply. There are filters for Member Name, Account Name, Approval Status, Location, Age, Gender, Payment Options and much more. The Snapshot area of the Manage area of the Online Registration gives you a summary of your selections made. Here we will walk you through this section and what it denotes. Registration Snapshot — This summary will be based on your search filters and give you a summary of accounts, members, and your financials. REMEMBER your check and custom payments will not calculate in your financials until you have processed and set them as paid. [R] [T] denote if a swimmer is a Returning member or Transfer Member — If this area is blank they are new. The [T] will only show if it is selected using the [Ask USA Swimming Transfer Question] is toggled to Show and Required. Managing your payments — Click Pay to process payments (cash, checks and custom payments) or to apply a partial payment. If the parent paid by credit card and it was approved their Status will be set to Pending Team Approval. 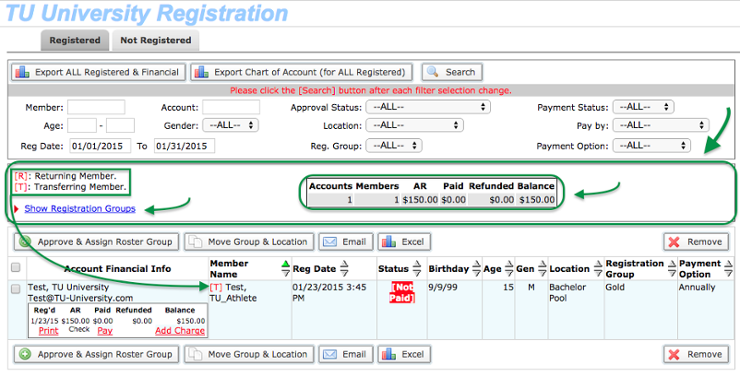 If the member paid by check or other (custom payment) the Payment Status will show [Not Paid]until processed. Once you click Pay, you will be asked to enter in the Check #, Amount and a Memo if applicable. Click Pay NOW after entering the data, or Cancel if you clicked Pay by mistake. After entering a payment, a Refund link will also be available. Credit card refunds will be automatically refunded to the card without any further intervention from the administrator. Once you click Refund you will be prompted to enter an Amount, select a Chart of Account, and input a Reference Number (Check, Cash, or Custom Payments only). Click Refund NOW after entering the data, or Cancel if you clicked Refund by mistake. Filtering Members and then selecting them by Roster Groups allows you to more efficiently work through Roster Groups, Payment Options and Locations. If you have multiple Roster Groups, Locations, and Payment Options it is a best practice to filter your results down to specific Roster Groups, Payment Options and Locations to best utilize your ability to Approve & Assign to Roster Groups. Note: If you have not set up Roster Groups, Locations or Billing Groups please do so before you proceed with Approving & Assigning Roster Groups. For more information on how to create Roster Groups, Locations or Billing Groups visit Online Registration: Step 1 or our Knowledge Base on Roster Groups, Locations or Billing Groups. Approve & Assign Roster Groups – This feature allows you to push the information you have captured in the Online Registration to your Account/Member Admin. Information is sent over to the Account/Member Admin once Accounts/Members are approved and assigned to a Roster Group. Filter your accounts to a specific groups/location/payment option and so forth. For [Returning Members] — either leave the switches as “keep existing” to keep the same settings as what is currently set in your account/member admin area or update this information either here or in the Account Member Admin area once your registration has been completed. Save Changes, work through your Registration Groups and Payment Options and you're ready for the season. Once your registration has been completed/closed for the year it is a best practice to turn all non-registered members to a “Suspended” status. This helps to clean up your Account/Member Admin system and keeps your system in good shape for next year. Click on the Not Registered tab at the top of the page — this will take you to all accounts who are not yet registered. (Note: The default setting is set to Member Status = All Non-Canceled accounts.) Everyone still in this area has not yet registered for your team. 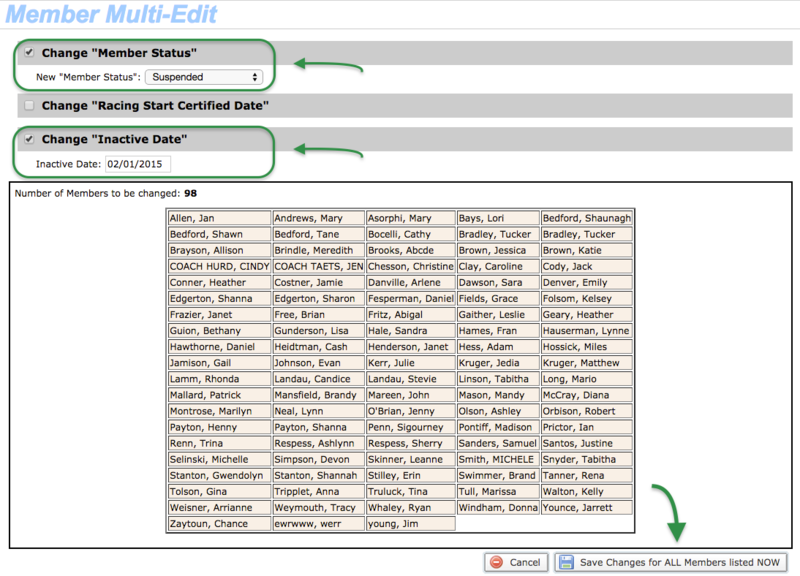 Once inside the Multi-Member Edit page – Select Suspended for Change “Member Status”. To keep you system up to dat you may want to Change “Inactive Date” to a date this year. Once all changes are made as desired click Save Changes for ALL Members listed to NOW. We are so excited that you completed the Online Registration Process! Be it your first Online Registration or your 15th we hope you were able to run a it successfully. If you have any further questions or need any help please visit our Knowledge Base on on Online Registration or find help using the Online Registration Checklist, or contact TU Support.